MEXICO CITY — Mexico's president-elect Andres Manuel Lopez Obrador promised Wednesday to investigate the disappearance four years ago of the 43 rural teachers college students, telling parents that his government won't fear the truth. 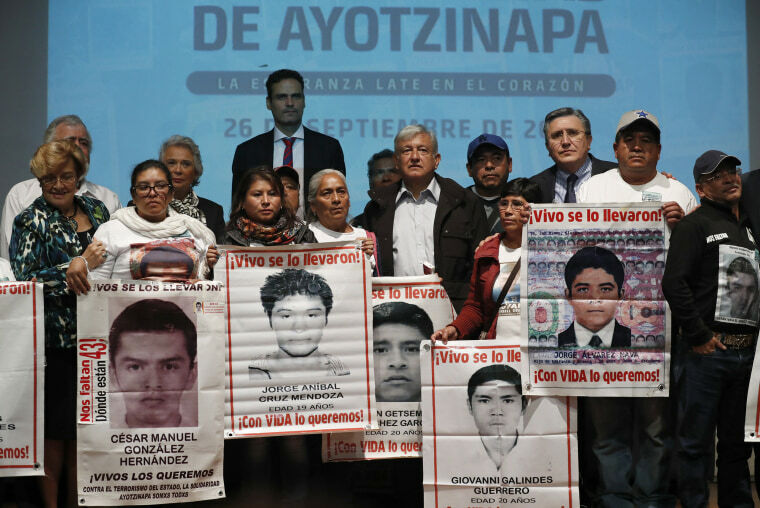 Lopez Obrador stood hand-in-hand with families of the Ayotzinapa students in an emotional gathering marking the day the students went missing while on their way to Iguala, Mexico to protest and raise money. “We shall not fear the truth. Our institutions are strengthened with the truth. It is not true that they will be weakened by an investigation. What weakens them is hiding the truth,” Lopez Obrador said. “There will be justice,” he added, "and we will find out where these young men are and punish those responsible." Lopez Obrador, leader of the new left-leaning political party Morena, takes offices Dec. 1. In June, a Mexican tribunal ordered the creation of an independent commission to investigate the disappearance of the students in conjunction with human rights organizations and the United Nations. The years since the students were taken by police have been filled with protests and prayer. Some protests have turned violent, but as the years have passed the parents, mostly rural farmers, have been left with only their grief, not knowing whether their children are alive or dead. They also have spent years begging authorities to deepen their search for the students. “I’d like to thank Mr. President (Lopez Obrador) for his trust, kindness and will to receive us," Maria Elena Guerrero, mother of missing student Giovanni Galindes Guerrero said. "We have been struggling to open the government’s doors for four years and it’s an honor that this door was opened on its own. It is a ray of hope for us." The students' disappearance in 2014 threw the administration of current President Enrique Peña Nieto into crisis, from which it never fully recovered. Explanations it provided were knocked down and arrests dismissed. His administration maintained that the students were handed over by the corrupt municipal police to a local organized crime group, Guerrero Unidos. The crime group subsequently brought the students to a garbage dump in the nearby town of Cocula, where they were killed and burned to ashes, the government has said. But independent forensic experts were unable to identify the origin of the garbage dump ashes and were only able to positively identify the remains of one student Alexander Mora Venancio, whose charred bone was found on a nearby riverbank. Another group of experts reaffirmed in September 2015 that the students were not burned in the garbage dump and urged government investigators to keep searching for the students. Although the government made arrests, it was later revealed that those arrested had been tortured before providing statements. Dozens of police officers are still being detained awaiting sentencing. Luis Ernesto Vargas Silva, the rapporteur on the Ayotzinapa case for the Inter-American Commission on Human Rights, part of the Organization of American States, told NBC News that political will is key to making sure the investigation will advance. The commission has asked the government to answer a number of questions about the students' disappearance, including why the students had been closely surveilled by state security forces before the attack. “The commitment of the president-elect is of such a large magnitude that we view it with hope and faith,” Vargas said.